You never know where a song or a hike in the forest will take you. Sometimes it can lead to another path. That happened a few years ago in 1996, while I was living near San Francisco. I caught up with musician and songwriter Dennis Kamakahi during a mainland tour, where he sang about his love for the aina. Dennis recalled what inspired him to write one of his most popular songs, “Wahine ‘Ilikea,” in 1974. One day as he was glancing up at Kamakou Mountain, the highest peak on Molokai, the mist parted and he saw 11 waterfalls. “It’s like a woman who reveals her beauty to the one she loves,” he said. “So the mist parts and reveals the beauty of the land.” Thus the title, “Wahine ‘Ilikea” (Fair-Skinned Woman), speaks of the white mist of Kamakou, revealing the waters of Hina, Goddess of the Moon, who gave birth to Molokai. Soon I was on a plane heading back to Molokai, to re-connect with my ohana and to hike back into the valleys and places that once nurtured my soul. After being away for 15 years, it was time to come home. To mark the centennial of the Hawaii Forest Reserve System, the state recently declared 2003 the Year of the Hawaiian Forest. Good time to take a hike, I thought, so l left the hustle and bustle of Honolulu to explore Kamakou Preserve, on the slope of Kamakou Mountain. In 1982, Kamakou became the first preserve established by the Nature Conservancy of Hawaii. Its nearly 3,000 acres are an important source of water for Molokai. Conservancy guide Doug Macmillan led the way on the three-mile hike, showing our group Kamakou’s “awesome beauty” and keeping us from disappearing down any hidden lava tubes. 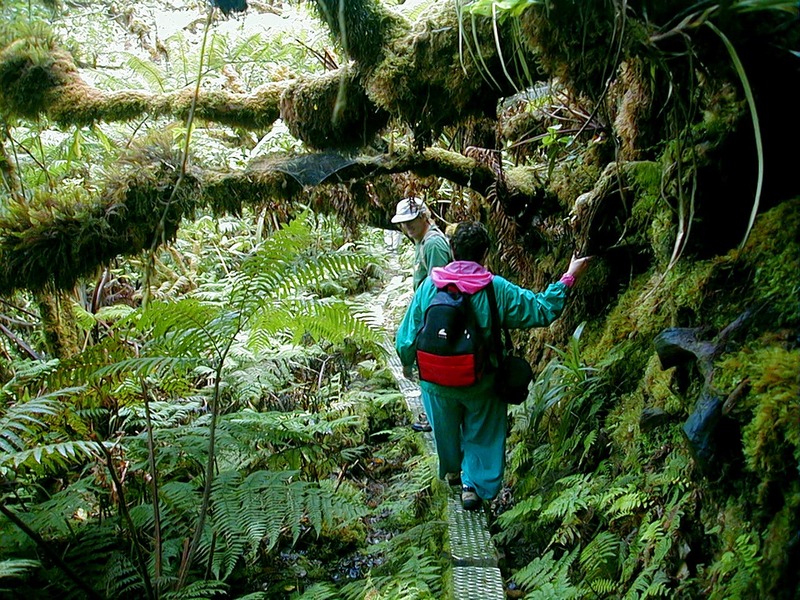 Kamakou rain forest is home to more than 200 species of plants found only in Hawaii. As we walked along the narrow wooden boardwalk protecting the trail, native birds chattered away. Dewdrops glistened like jewels in the lush forest. Thick green carpets of moss invited us to stretch out and take a nap. And always, in the background, you could hear the sound of water, trickling down trees, in streams and alongside the trail. It was an amazing adventure for hikers like me and Molokai resident Lyn Bonk. As we hiked further, the giant hapuu and amau ferns grew bigger. Then suddenly the forest shrank. We found ourselves in Hawaii’s most ancient bog, a garden of miniature bonsai-size plants accented by bright red lehua blossoms. A lot of blood, sweat and tears has gone into managing Kamakou Preserve, according to Ed Misaki, director of the Conservancy’s Molokai Programs. “The ancient Hawaiians had a saying, ‘Hahai no kau ua i ka ulu laau,’ which means ‘Rains always follow the forest,'” says Ed, who was born and raised on Molokai. 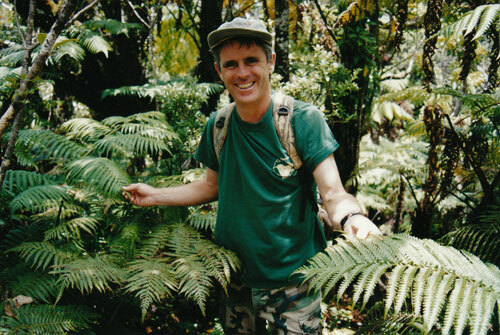 “They knew that the native forest somehow attracted or produced water.” He laments that over the years, Hawaii has been losing its native forests. A journey into Kamakou Preserve can remind us to appreciate and take care of Hawaii’s natural treasures. If we don’t, we could lose them. At the end of the boardwalk trail, we gazed into Pelekunu Valley, flanked by the highest sea cliffs in the world. What a gift, I thought. Then, looking up, I saw the 4,970-foot Kamakou summit, shrouded by just a few clouds. As we turned to leave, the white mist of Kamakou Mountain rolled in. To find out more about volunteering for environmental activities go to www.malamahawaii.org.